Ara Sanjian is Associate Professor of Armenian and Middle Eastern History and the Director of the Armenian Research Center at the University of Michigan-Dearborn. Born in Beirut, Lebanon, he received his school education there. 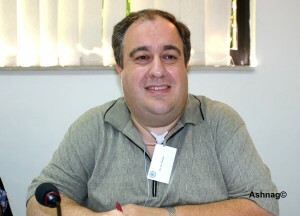 From 1986 to 1991 he studied for his master’s degree in history at Yerevan State University. From 1991 to 1994 he did his PhD in modern history of the Middle East at the School of Oriental and African Studies, the University of London. From 1996 to 2005 he was the Chairman of the Department of Armenian Studies, History and Political Science at Haigazian University in Beirut. In fall 2003, he was the Henry S. Khanzadian Kazan Visiting Professor in Armenian Studies at California State University, Fresno. His research interests focus on the post-World War I history of Armenia, Turkey and the Arab states of Western Asia. He is the author of Turkey and Her Arab Neighbors, 1953-1958: A Study in the Origins and Failure of the Baghdad Pact (2001), as well as a monograph and a number of scholarly articles. He is currently working on a book-length project on the Armenian quest for Mountainous Karabagh under Soviet rule in 1923-1987.